August 19, 2009  On a remote fjord in northwest Greenland, traditional Inuit hunting techniques are being used to stick tiny, high-tech satellite tracking devices onto narwhals — a kind of Arctic whale famous for its long, spiral unicorn horn. August 18, 2009  Way up north in the Arctic, one researcher spends summers studying the narwhals — whales with a unicorn horn. Much remains unknown about the life and behaviors of these wily creatures, which are extremely tough to track. August 15, 2009  Nell Greenfieldboyce describes her travels to Greenland to report on narwhals — whales with a long, spiral unicorn horn. In the tiny town on a remote fjord, during the 24-hours of sunlight season, she writes: "Life seemed to slow down. I did not want to leave." August 13, 2009  An expert panel asked by President Obama to make recommendations about the future of human spaceflight has said the goal of returning to the moon by 2020 isn't feasible if NASA's budget continues at its current level. The panel is scheduled to the brief the White House on Friday. Forty Years After Space Race, What's Next? July 21, 2009  Forty years ago, the Cold War pushed the United States to the moon. 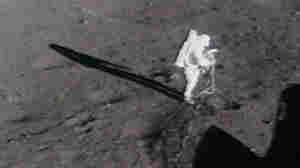 Now, NASA hopes to return to the moon to further scientific exploration, technology development and economic expansion. But some groups think instead of focusing on the moon, NASA should invest in traveling to places like near-Earth asteroids. What Do Kids Think Of Another Moon Shot? July 20, 2009  Many people working at NASA now were inspired by the Apollo missions they saw on TV as kids. What that future holds may indeed depend on how young people now think about going to the moon and beyond. July 16, 2009  After failing to find the originals, NASA refurbished the existing footage with help from Hollywood. July 7, 2009  In sweltering summer heat, mowing the lawn can become the most dreaded chore. But robotic lawnmowers may soon enough allow Americans to do the job without the labor. June 25, 2009  Salty ice grains inside in Saturn's outer ring point to a possible underground ocean on the moon Enceladus. June 18, 2009  A rocket is scheduled to blast off for the moon Thursday afternoon carrying two probes that will gather data to prepare for possible future manned missions. One probe will map the moon, and the other will search for water ice. June 17, 2009  NASA will launch Thursday two missions to the moon. One spacecraft will orbit the moon and create an unprecedented high-resolution map of the lunar surface. The other mission will send a spent rocket part on a collision course with a permanently shadowed lunar crater. June 4, 2009  Apes often make weird sounds when they're tickled, and a new study says these noises are related to human laughter. The researchers think laughter may have evolved from a primordial, laughlike sound made by a common ancestor of apes and humans. May 28, 2009  In 1959, the United States finally succeeded in sending monkeys into space and bringing them home alive. Two years before any humans, Able and Baker were launched about 360 miles up and experienced about nine minutes of weightlessness. May 27, 2009  For the first time, scientists in Japan have shown that monkeys genetically engineered to glow green can pass on this trait to their offspring. This means scientists are closer to breeding monkeys that carry human disease genes, which could be useful in medical research. May 23, 2009  If confirmed by the Senate, Charles Bolden would become the first African-American to be NASA's administrator and only the second former astronaut. The announcement from the White House came as bad weather forced NASA to postpone its attempt to bring home the space shuttle Atlantis.